NationStates • View topic - Can you "40K-ify" the Vickers A1E1 Indepedent? Can you "40K-ify" the Vickers A1E1 Indepedent? I'm just curious if someone can do something to the Vickers Independent to make it feel like it could exist in the 40K universe. The design itself is strange enough that it can almost be like a Malcador Heavy Tank or the likes, I'm also a little bit tired from seeing the Leman Russ Tank(not that it's bad heck I actually love the tank and the Primarch himself, just that it's the only thing I keep seeing)and wonder just how desperate the Imperium or specifically, the Adeptus Munitorum, would scrap the bottom of the barrel if they ran out of Leman Russ tanks. 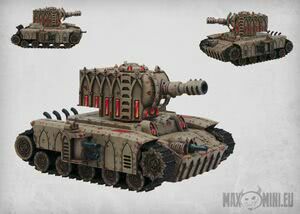 Seeing as there is a space KV-2 it's not impossible to think that someone in the Imperium found this relic from the Age of Strife and slap something on it to make it work. And the thing I want to see can be spread out to the galaxy, I can see the Orks the number 1 candidate to actually use this and work thanks to how the universe bends to their will. So, if anyone has the time and interest on this, can you try and "40K-ify" the Independent? You don't even have to kitbash a model, you can use photoshop or a 3D modelling software like Blender. I don't know, I'm just curious if someone can make the Independent, slap some bolters on it and maybe an Aquila or Skullz on it(paint it red maybe)or even tentacles if you're feeling creative. Last edited by Vulkata II on Tue Apr 16, 2019 8:23 pm, edited 1 time in total. To be fair, they still are METAL BAWKES but... Actually no, they are Baneblades. Take the central turret off, place a bigger turret with a bigger gun, stick a ram on the front of it and throw an Aquila somewhere.